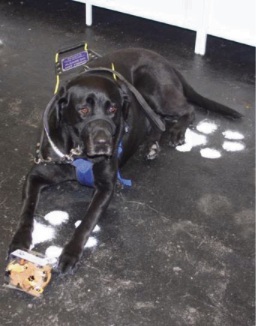 Lee Ann Hales guide dog Viva. A ROCKINGHAM woman was left gobsmacked after a taxi driver refused to allow her and her guide dog in his taxi. Lee Ann Hales said witnesses to the incident at the Rockingham Train Station were also stunned. “It happened last night; I approached the taxi and the driver said to me ‘I can’t have a dog in the car’. I said ‘excuse me?’ He then said ‘if the owner knew I used the taxi for dogs’ and ‘where would we put the dog?’,” she said. “Then the security guards ran up and told him he can’t refuse me travel and that guide dogs are allowed anywhere. Not long after that he drove off. “I have put in an incident report with (the taxi company) and it was captured on CCTV. “It’s demoralising; I’m starting to get very fed up with it. “Every taxi company and airline have refused people with guide dogs at some point. A Department of Transport spokeswoman said they had begun an investigation into the incident. “Taxi drivers are required to carry guide dogs when requested and can be subject to fines of up to $1000 and a review of their suitability to drive if they refuse a fare due to this request,” she said. “The Department of Transport treats complaints of this type very seriously and has previously prosecuted drivers for this type of offence. Swan Taxis has been contacted for a response.